TODATakeoff Distance Available – The length of the takeoff run available plus the length of the clearway, if clearway is provided. (The clearway length allowed must lie within the aerodrome or airport boundary. According to the Federal Aviation Regulations and Joint Aviation Requirements (JAR) TODA is the lesser of TORA plus clearway or 1.5 times TORA).ASDAAccelerate-Stop Distance Available – The length of the takeoff run available plus the length of the stopway, if stopway is provided.LDALanding Distance Available – The length of runway that is declared available and suitable for the ground run of an airplane landing.EMDAEmergency Distance Available – LDA (or TORA) plus a stopway. Runway end identifier lights (REIL) – unidirectional (facing approach direction) or omnidirectional pair of synchronized flashing lights installed at the runway threshold, one on each side. Runway end lights – a pair of four lights on each side of the runway on precision instrument runways, these lights extend along the full width of the runway. These lights show green when viewed by approaching aircraft and red when seen from the runway. Runway edge lights – white elevated lights that run the length of the runway on either side. On precision instrument runways, the edge-lighting becomes amber in the last ၂,၀၀၀ ပေ (၆၁၀ မီတာ) of the runway, or last third of the runway, whichever is less. Taxiways are differentiated by being bordered by blue lights, or by having green centre lights, depending on the width of the taxiway, and the complexity of the taxi pattern. Runway centerline lighting system (RCLS) – lights embedded into the surface of the runway at ၅၀ ပေ (၁၅ မီတာ) intervals along the runway centerline on some precision instrument runways. White except the last ၉၀၀ မီတာ (၃,၀၀၀ ပေ): alternate white and red for next ၆၀၀ မီတာ (၁,၉၆၉ ပေ) and red for last ၃၀၀ မီတာ (၉၈၄ ပေ). Touchdown zone lights (TDZL) – rows of white light bars (with three in each row) at ၃၀ or ၆၀ မီတာ (၉၈ or ၁၉၇ ပေ) intervals on either side of the centerline for ၉၀၀ မီတာ (၃,၀၀၀ ပေ). Taxiway centerline lead-off lights – installed along lead-off markings, alternate green and yellow lights embedded into the runway pavement. 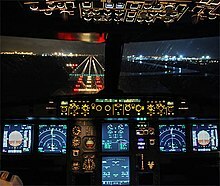 It starts with green light at about the runway centerline to the position of first centerline light beyond the Hold-Short markings on the taxiway. Taxiway centerline lead-on lights – installed the same way as taxiway centerline lead-off Lights, but directing airplane traffic in the opposite direction. Land and hold short lights – a row of white pulsating lights installed across the runway to indicate hold short position on some runways that are facilitating land and hold short operations (LAHSO). Approach lighting system (ALS) – a lighting system installed on the approach end of an airport runway and consists of a series of lightbars, strobe lights, or a combination of the two that extends outward from the runway end.